July 2013 - ANDY NICHOL CYCLES LAND'S END TO JOHN O'GROATS - Andy tells his own story. After two long weeks in the saddle we finally completed our 1,000 mile cycle trip from Land’s End to John O’Groats. Travelling with 24 other equally mad enthusiasts we rolled into JOG last Saturday afternoon after an exhilarating and adrenalin fuelled final day! It was with a mixture of self-satisfaction, emotional release and sheer exhaustion that we completed the distance and were able to really enjoy the achievement. You can always surprise yourself and go that extra distance when you already think you are spent. The quality of Scottish road surfaces is absolutely appalling and ……. You can never have enough “lubrication” in vital areas as a defence against debilitating saddle sores!! Picked up a few bumps and bruises over the 2 weeks resulting from several inelegant dismounts from my bike, i.e. falls and so I've spent this week chilling out at home - the first couple of days were like a wave of tiredness as the efforts of the cycling took their toll. All is good now and I even managed a day at the cricket in Taunton - also had a follow up CT scan this week and hopefully all will be good when I see Jeremy Braybrooke next week. A young Bristol woman was diagnosed with breast cancer when she was 27 weeks pregnant. Karen Gingell’s son George was delivered six weeks early in August last year and then spent two weeks in intensive care at Southmead Hospital. It was only hen when they returned to their Thornbury home that Karen (31) began her delayed chemotherapy treatment and later radiotherapy. 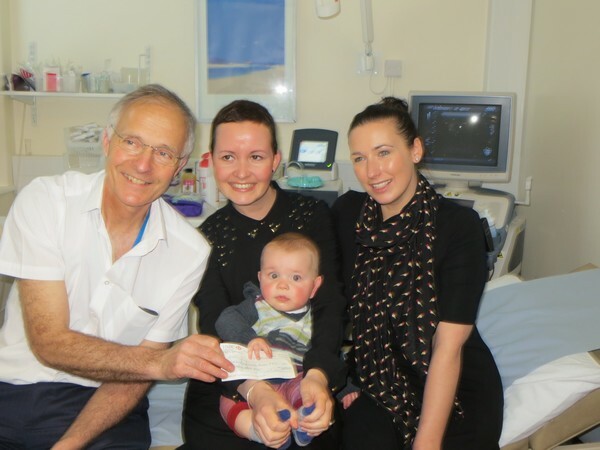 Now well on the road to recovery and with George a happy, healthy baby Karen has made a £612 donation to BUST as a thank-you for the dedicated care she received from the Breast Care Centre team and support staff. The money was raised through an afternoon sale of home- made cakes which proved a sell-out success. Karen and her best-friend Stephanie Mitchell were the prime organisers of the event at Stephanie’s Patchway home at the end of February. Karen’s husband James, 33, her mother Mrs Kath Evans and Stephanie’s mother Mrs Ruth Alder, also provided key support. Karen recalls: “I was on holiday when I discovered a lump in my breast. My GP referred me to Southmead where they diagnosed breast-cancer. I had a lumpectomy and fortunately the cancer had not spread to the lymph nodes. When George came home I had four months of chemotherapy and later radiotherapy. I shall be taking Herceptin until the end of this year. We wanted to raise money for the Unit because the medical team and staff have been amazing since my diagnosis. Our families and friends have also been very supportive, particularly with the fund- raising. I have been inspired to help others, particularly young women.